We’d love your help. Let us know what’s wrong with this preview of Syllabus by Lynda Barry. The award-winning author Lynda Barry is the creative force behind the genre-defying and bestselling work What It Is. She believes that anyone can be a writer and has set out to prove it. For the past decade, Barry has run a highly popular writing workshop for nonwriters called Writing the Unthinkable, which was featured in The New York Times Magazine. Syllabus: Notes from The award-winning author Lynda Barry is the creative force behind the genre-defying and bestselling work What It Is. She believes that anyone can be a writer and has set out to prove it. For the past decade, Barry has run a highly popular writing workshop for nonwriters called Writing the Unthinkable, which was featured in The New York Times Magazine. Syllabus: Notes from an Accidental Professor is the first book to make her innovative lesson plans and writing exercises available to the public for home or classroom use. Barry teaches a method of writing that focuses on the relationship between the hand, the brain, and spontaneous images, both written and visual. It has been embraced by people across North America—prison inmates, postal workers, university students, high-school teachers, and hairdressers—for opening pathways to creativity. To ask other readers questions about Syllabus, please sign up. Why is it not only suggested but also required that we use comp books instead of blank ones, let alone sketchbooks? I looked through the book to find an answer but there was none found. which I am using in my Teaching of Writing in Middle and High School English class this term. The book is actually a kind of syllabus and notes with drawings fromher and her students for you to use as artist or teacher. The section of the course it particularly pertains to is an assignment for my students to create a visual essay on a topic of their choice using drawing and words. It could be narrative, it could be memoir, but I asked them to work in the direction of—not didacticism, but—persuasion, so my students are writing and drawing about the virtues of mixed race relationships, veganism, or opposed to online courses, and so on. The topics are less surprising than the multi-media approaches I am seeing, thanks to Lynda Barry’s helping free them to be creative, to invent, to relax and enjoy. In the last several years after a life of making comics and doing comics workshops, Barry has created 100 Demons, What it Is and this great book. She is sharing herself as artist and teacher with the world, maybe especially students, but I know lots of adults using this book to get creatively back on track. This is an amazing graphic treatment of information about Lynda Barry's classes, from exercises for noticing to actual syllabi. I stole a bunch of ideas for various storytelling uses (giving her credit of course) and plan to pull some in to my storytelling class in May. This is one I need to buy. Caution: This book may make your eyes hurt. Ok. So. I'm fairly sure this is meant as a Learn/Teach Creativity guide-like piece. It's Barry's notebook from her time as an art teacher. This is a book of notes, drawings, and syllabi I kept during my first three years of teaching in the Art Department at the University of Wisconsin-Madison. The chronology is rough and mixed up in places but all kept by hand on pages of either legal pads or in standard black and white marbled composition notebooks" (p. Caution: This book may make your eyes hurt. It's a messy compilation of her notes, ideas, lessons to tap into students' creativity, ways to tap into her own creativity plus pictures gah-lore. It's packaged as the aforementioned composition notebook so could get confused with Marissa Moss' Amelia books...and, come to think of it, would probably be just as entertaining, though for different reasons. If you've got a learning style that syncs up with the optically-overloading format, this book will teach you fun ways to learn, to teach, to reach those creative moments where you thrive, etc. I appreciate it less for the lessons to be learned and more for the love of note-taking and scribbling. I can't say that some of my own notebooks look dissimilar, though much less colorful. Apparently I forgot to mark this book as "read" after I finished it. Oops. Well, anyway! This is a really, really great book. Very inspirational for creative people of any kind (or anyone who wants to be creative, but is afraid of not being "good enough"). It's really funny and helpful and I highly recommend it! I cannot even imagine having Lynda Barry as my instructor. I get all tingly just thinking about it. Life goal: take a class from Lynda Barry. Or just have her tell me what to do with my life in general. Excellent book about creativity and writing and drawing, presented in Barry's signature style of illustration. I've tried some of the exercises and am continuing to work on the 4-minute daily diary. Definitely one I'll be referring to in the future! Book blurb: For the past decade, Lynda has run a highly popular writing workshop for non-writers called Writing the Unthinkable - the workshop was featured in the New York Times magazine. Syllabus: Notes from an accidental professor is the first book that will make her innovative lesson plans and writing exercises available to the public for home or classroom use. I have read the entire book, re-read portions, and implemented some of the exercises already. Chock-full of ideas and exercises, ther Book blurb: For the past decade, Lynda has run a highly popular writing workshop for non-writers called Writing the Unthinkable - the workshop was featured in the New York Times magazine. Syllabus: Notes from an accidental professor is the first book that will make her innovative lesson plans and writing exercises available to the public for home or classroom use. I decided to mark this one as read, because I think I'm actually going to keep reading it forever. I love Lynda Barry's books, especially Picture This, and I have passively audited some of her classes via her tumblr. This book came out as I was reaching my apex of feeling antsy, uncreative, and tired (at least I hope it's the apex). I feel really renewed in my desire to create stuff, largely unconcerned with how good it turns out. I need to make more. I need to draw more. I need to use materials I decided to mark this one as read, because I think I'm actually going to keep reading it forever. I love Lynda Barry's books, especially Picture This, and I have passively audited some of her classes via her tumblr. This book came out as I was reaching my apex of feeling antsy, uncreative, and tired (at least I hope it's the apex). I feel really renewed in my desire to create stuff, largely unconcerned with how good it turns out. I need to make more. I need to draw more. I need to use materials I'm unfamiliar with, and ones I'm extremely familiar with. I just need to push myself to do something. I used to fill up comp books with notes from books, scenes from movies, problems I was trying to work out, ephemera, and drawings. The drawings stopped a long time ago. Now I use my phone for the writing part. After reading Barry's Syllabus, I realize I want to go back to comp books. Thanks to Barry, I realized that I miss the tactile, meditative nature of pen on paper. Syllabus is a book about teaching art, but it's also about the ineffable process of making art. That magic time when thinking di I used to fill up comp books with notes from books, scenes from movies, problems I was trying to work out, ephemera, and drawings. The drawings stopped a long time ago. Now I use my phone for the writing part. After reading Barry's Syllabus, I realize I want to go back to comp books. Thanks to Barry, I realized that I miss the tactile, meditative nature of pen on paper. Syllabus is a book about teaching art, but it's also about the ineffable process of making art. That magic time when thinking disappears and some inner source takes over and your pen moves on the paper freely. If you used to draw but stopped because you didn't think you were any good, but you enjoyed drawing, read this book. I read this first in 2014 and it blew my mind as far as developing a notebook habit. Re-reading it today for my Humanities course and lord, let Lynda Barry watch over me as I try to impart some of this wisdom to freshmen. Fingers crossed! This is a great book, full of ideas and exercises. I will be stealing ideas for my own writing classes and personal practice. This was great--very interesting, with some beautiful insights on creativity. But I can't help but feel that Lynda Barry seems like a total hardass as a professor. I admit that I'm biased and went in with an abiding admiration for Lynda Barry already in place, but hot damn. This book is brilliant. BRILLIANT. Get thee to a bookstore and buy it. You can check it out from the library, but that is only postponing the inevitable. If it wasn't 9:30 at night, I'd go out and buy a non-photo blue pencil right now. As it is, I'm starting my 4-panel daily diary tonight--I've been bummed that I haven't been able to write as much as I used to, and this method is perfec I admit that I'm biased and went in with an abiding admiration for Lynda Barry already in place, but hot damn. This book is brilliant. BRILLIANT. Get thee to a bookstore and buy it. You can check it out from the library, but that is only postponing the inevitable. If it wasn't 9:30 at night, I'd go out and buy a non-photo blue pencil right now. As it is, I'm starting my 4-panel daily diary tonight--I've been bummed that I haven't been able to write as much as I used to, and this method is perfect. BRILLIANT. I covet Syllabus and found an even deeper love for Lynda Barry than I thought possible. Just draw (or paint or sculpt or dance) and don't worry if it looks imperfect or childish. Experience the act of making something with your hands/body. The book looks like a composition notebook, one of those black and white marbled notebooks seen in massive stacks at stores during the back-to-school season. Barry uses very humble materials. They are not low quality, but humble -- crayons (pg.87), non-photo blue pencil (), Flair felt pen (). The title page and verso are not very obvious at all, which caught me, as a librarian, off guard. There is no table of contents and no index. The text just starts with the question "Is Creative Concentration Contagious?" There is a method to the seeming madness, however, and the book includes a story about the class Lynda Barry taught. There are a lot of slightly scary (I am not a horror person) and disturbing images in this book; a lot of the images are dark. This books is probably not appropriate for 5 year olds, but is perfectly fine for the tween to adult set. Also, it is a good reminder that not all drawings (or quilts or other artworks) are pretty in a conventional sense. This does not diminish other aspects of the piece (pg.29). The encouragement to just be creative regularly is the point. The book discusses drawing a lot - not theoretical aspects, but the sheer magnitude of work the students are expected to create. Yes, you get better the more you practice, but you also have an "experience by hand" (pg.31), which has value. Barry writes "...what if the way kids draw -- that kind of line that we call 'childish' -- what if that is what a lines looks like when someone is having an experience by hand?" (pg.31). When I work, there is definitely something I gain by having fabric in my hands. It may be because my paid work is just stuff appearing on a screen while my quiltmaking is more of a whole body experience. There is so much that translates directly to quiltmaking; I almost couldn't take it all in. "I told them to color had in order to do it right. And go straight to use force -- thinking I was showing them a short-cut -- this took way the way of coloring they would have found on their own. By telling them just how to do it, I took the playing-around away, the gradual figuring out that bring something alive to the activity, makes it worthwhile, and is transferrable [sic] to other activities." (pg.89) I love this passage. It makes me wonder if there is joy in using quilt patterns. Sure you have a quilt when you finish, but did the making of a design that someone else has already made bring joy to the quiltmaker? One good reminder (pg.19) is that even though we don't like a piece of our artwork, it survives. This reminds me of finishing a quilt and being very glad to be done with it. Still, six months later, the quilt is one of my best. It is a good thing to remember that our work survives even if we don't like it. Barry also states "Liking and not liking can make us blind to what's there." (pg.23). I make no secret of not liking brown and having a hard time appreciating Civil War reproduction fabrics. Some years ago, I forced myself to look more carefully at some of these types of quilts in order to appreciate the piecing and the design. while I have a hard time imagining such quilts in brights and dots, I can appreciate intricate and exact piecing. The book is filled with tips, many of which dovetail with what I am trying to do with my blog. One states "I know if I can just keep them drawing without thinking about it too much, something quite original will appear..." (pg.21). I think it is very important to keep working, even if you make a lot of crap, because at some point, something great will happen that wouldn't have happened if you hadn't done so much mediocre or okay work. One tip is to use smaller spaces. Lynda has her students fold 8.5"x11" sheets of paper into 16 squares and use those for their drawings. Friend Julie is making small square quilts as an exercise. Is this something that would jolt my creativity? Words in the book described as tips become profound when I think about them. One such group of words is something that I tried to espouse in the Creative Prompt Project. "Daily practice with images both written and drawn is rare once we have lost our baby teeth and begin to think of ourselves as good at some things and bad at other things. It's not that this isn't TRUE but the side effects are profound once we abandon a certain activity like drawing because we are bad at it. A certain state of mind (what McGilchrist might call 'attention') is also lost. A certain capacity of the mind is shuttered and for most people, it stays that way for life" (pg.115). This quote, idea hits close to home. I know I do it. It is easier to do things I am good at. I don't do needle-turn applique' because it is hard and I have to work at it. I want the time I spend to mean something more than ravelly edges on a piece of applique'. Still, what am I losing with this attitude? One aspect of the ideas in the text that really struck me was about images. Lynda Barry writes "I was trying to understand how images travel between people, how they move through time, and if there was a way to use writing and picture making to figure out more about how images work. (pg.49) This idea has been rumbling around in my head, including related to quiltmaking. We know that newspapers used to print patterns. We know that ladies would trade patterns. Now we have digital cameras and record quilt images that way. Still, we see images and they rumble around in our heads, morph and change before they become a quilt. Even when they become a quilt, changes are still possible. The other thing about this book is the author encourages us to notice things. The composition book acts as a life note book. She encourages a small box to record things students did, saw, heard and then there is a space for a daily drawing. "what goes into your diary are things that you noticed when you became present -- that is to say when the hamster wheel of thoughts and plans and worries stopped long enough for you to notice where you were and what was going on around you -- little things..." (pg.61). This happens to me when I walk and am not listening to a book. This book makes me think I should do that more often. Partway through the text, Barry writes "sometimes right before class I'll see students rushing to finish the homework I gave them and I always feel sad. They'll get nothing from the work without the state of mind that comes with it. It's a thing Dan Chaon calls 'Dreaming Awake' - we can use writing and drawing to get to that state, but not by rushing" (pg.128). I think I get to this state when I am piecing a lot of the same types of pieces. It allows me to accomplish something in the quiltmaking world while my mind wanders off to other places to solve other problems. I don't think we have enough of this type of time. While I like to have a basic plan in place when I start a quilt, often I just want to try something and that ends up as a quilt, like the Swoon did. I think there was an element of this type of working in the IRR as well. Lynda talks about this when she says "It's a kind of picturing that is formed by our own activity, one line suggesting the next. We have a general direction but can't see where we are until we let ourselves take a step, and then another, and then we move on to the third"(pg.136). There is an element of uncertainty when working this way, but also an element of excitement, because the maker does not know exactly where s/he is going. Fixed places are a concept I cannot completely wrap my head around, but if what I think the author is talking about is true, I can identify at least one group of fixed places relevant to my life. Lynda B writes "Poets claim that we recapture for a moment the self that we were long ago when we enter some house or garden in which we used to live in our youth. But these are most hazardous pilgrimages, which end as often in disappointment as in success. It is in ourselves that we should rather seek to find those fixed places, contemporaneous with different years" (pg.181). I wonder how fixed places affect our lives. The point about failure and success is well taken. You can't go back and we do look back on the past with rose colored glasses and forget the difficult parts. Finally, Ms. Barry talks about journals. Journals, as you know, are near and dear to my heart. I have kept one for years and she gives voice to my thoughts on journals and writing in a journal when she says 'the nature of notetaking by hand. Thinking of one's compbook as a place. The practice of developing a place not a thing" (pg.194). For me, a journal is a place to think. It can be a mess. If you force yourself to make it beautiful it might be less useful. For me, it is less useful if I have to make my daily journal a gorgeous visual journal. I need a place to dump and my daily journal is that place. Towards the end of this 200 page book, Barry tells a story "He said that during those years, as a child, he used to imagine that he was the son of the emperor of China, and the old, wise advisors of his father set a spell on him: he would have to experience all these terrible events so when he grew up and became the emperor himself, he would not make war.Since, I stopped thinking that art is decoration in life; for me, it is proof that art is essential to our surviving." (pg.173). Using creativity to survive a terrible situation is so clever that I cannot think how this author thought of it except that he practiced and it was second nature. This is brilliant and inspirational-- a great source for ideas. BUT I don't necessarily think these syllabuses are the best way to organize information. It takes some training to figure out how to read it and retain the information. I wouldn't recommend reading it all quickly. It'd be better read over time, so that the ideas can find purchase. Very cool. And not just because of the free-form "multimodal" style. I liked the relaxed and introspective approach, however, I had a pet peeve. As fascinating as this was, I felt a little uncomfortable with Barry's reliance on the cold, hard empiricism of the brain, its processes and components, when she was flirting much more with the "mind" if that makes any sense. It affected my enjoyment somewhat. HOWEVER, this was a really cool visual novel, and if I ever get the notion, I would actually ki Very cool. And not just because of the free-form "multimodal" style. I liked the relaxed and introspective approach, however, I had a pet peeve. As fascinating as this was, I felt a little uncomfortable with Barry's reliance on the cold, hard empiricism of the brain, its processes and components, when she was flirting much more with the "mind" if that makes any sense. It affected my enjoyment somewhat. HOWEVER, this was a really cool visual novel, and if I ever get the notion, I would actually kind of like to use this book as a guide and try to use it as if I am actually taking her class. I draw comics a lot and I tried a few of her exercises and I really enjoyed the "growth" and just the interesting things that came out of the experience. I have no doubt that Lynda's students were challenged, frustrated, exhilarated, etc. and that they had a lot of fun as well. I read Roz Chast's novel at the same time and I was struck by the lack of introspection on Lynda Barry's part. She provided a little bit, but it was mainly through the eyes of a teacher looking at how her instruction is benefiting her students. This was wonderful, and completely appropriate, because the title reads "Syllabus" and all. But Chast was brutally honest in some places and I guess I found Syllabus lacked the emotional punch. It's incredibly unfair of me to judge the novel this way because Barry did not promise these things, and I can see how using Chast's style wouldn't be quite as effective with this type of work, but I think there was a missing element of disclosure. Barry must have been where her students were at one point in time. I would have loved to have read more of that...and read more traditional words in general, as others have mentioned. As others have mentioned, Barry’s Syllabus is a compilation of, you guessed it, syllabi, notes, and assignments sheets. It’s this kind of messy, exploratory compilation scanned into a neat package à la the Kurt Cobain journals, or something to that effect. It’s very busy, almost schizophrenic at times. I wouldn’t call it a graphic novel by any stretch of the imagination. If its format has an official moniker, I don’t know what it is. I didn’t really know what to make of it at first glance. The f As others have mentioned, Barry’s Syllabus is a compilation of, you guessed it, syllabi, notes, and assignments sheets. It’s this kind of messy, exploratory compilation scanned into a neat package à la the Kurt Cobain journals, or something to that effect. It’s very busy, almost schizophrenic at times. I wouldn’t call it a graphic novel by any stretch of the imagination. If its format has an official moniker, I don’t know what it is. I didn’t really know what to make of it at first glance. The first ten or twenty pages stress to students the importance of journaling. As an English instructor, it’s a practice I believe in, but I’ve always had trouble getting students to follow suit. Barry’s syllabi are mostly drawings, some of them resembling sequential art, which is a great tactic. It’s hard to dispute comic’s hold on readers of any age, how they help create a sense of visual and spatial awareness and foster a love of reading. Traditionally, syllabi are contracts, and most of them read like dense legal parlance. Barry’s approach makes them accessible to students, even if, at times, they can be hard to read. The book delves into much more than just an array of alternative classroom practices. It asks important questions about pictography, how pictures function as language, how our hands, images, and insight are connected. Much in the way Jonathan Gottschall explores the biological function of story, Barry wants to know the ways in which art sprouts from the human consciousness. I don’t believe her book comes to any sort of definitive answer, but it probably isn’t meant to. It sparked a lot of questions, nevertheless. Just staring at the cover of Lynda Barry’s work/notes I was overwhelmed and intimidated. I almost didn’t want to “read” it. Even in the first few pages, I found myself asking “What is this?” While I don’t even know that it can be categorized in one particular genre, I am not familiar with anything like it. This “book” catalogues the notes from a few semesters of Barry’s classes, including her syllabi, in a way that can only be described as a visual explosion. It is impressively creative. As a teacher, I am inspired by her ability to stimulate and motivate students to do something that they didn’t feel that they could do. She has wonderful ideas to inspire creativity! Several of her techniques of listing what you saw/ did/ heard in a day and drawing one of those things are ideas that I would like to toy with in my own English classroom. I was extremely interested in the ideas of teaching students to focus and using memories to create. However, as one who doesn’t consider herself artistically inclined in ANY fashion, she also makes me want to draw like I haven’t since I was a kid. I have recently been introduced to recording my daily doings in a composition book, but most of my work has been in writing (an area I am certainly comfortable in). I am looking forward to trying to add some “artwork” to my writing in my own way. However I can imagine that being a part of her class would be terrifying for me. I am honestly not sure who to recommend this to. Anyone interested in sparking their own creativity or the creativity of others is sure to enjoy. I loved this. As someone who left artistic skills in my past (what little I had to begin with), I found Barry such an inspiring teacher. I found myself wanting to actually follow along with the Syllabus and take months to go through this book. It's an unlikely book. Syllabus isn't just a title, it's a description of what is contained within. The bones of courses that Barry has taught in university are presented, augmented by various examples of students' work, Barry's own notes and doodles and o I loved this. As someone who left artistic skills in my past (what little I had to begin with), I found Barry such an inspiring teacher. I found myself wanting to actually follow along with the Syllabus and take months to go through this book. It's an unlikely book. Syllabus isn't just a title, it's a description of what is contained within. The bones of courses that Barry has taught in university are presented, augmented by various examples of students' work, Barry's own notes and doodles and other fun additions. While the amount of work expected by Barry in these courses does come across as a lot, I can't imagine the reward of going through one of them. I will definitely take elements that I read here and try to incorporate them into my life. The amount of introspection and pushing yourself that Barry encourages of the students is wonderful. Do you wish you could take one of Lynda Barry's classes related to interdisciplinary creativity? I do! Fortunately, Syllabus allows us to follow "Professor Old Skull" along some of the meandering paths she's carved out for her students. Syllabus is absolutely fantastic for creative inspiration. It got me to doodle more seriously than I had for years! The only reason I didn't give it 5 stars is because I didn't think the book came to any particular conclusions; it just raised a lot of philosophica Do you wish you could take one of Lynda Barry's classes related to interdisciplinary creativity? I do! Fortunately, Syllabus allows us to follow "Professor Old Skull" along some of the meandering paths she's carved out for her students. Syllabus is absolutely fantastic for creative inspiration. It got me to doodle more seriously than I had for years! The only reason I didn't give it 5 stars is because I didn't think the book came to any particular conclusions; it just raised a lot of philosophical questions that may not have objective answers. Quite possibly, one is meant to do the work and answer the questions for themselves. That's valid. Nevertheless, I would have enjoyed knowing more about the conclusions Barry has come to over the years. My brain looks nothing like Lynda Barry's, but I wish it could look like hers more. And I wish I could take a class from her. Reading her syllabi for her three art/philosophy/brain classes was very intriguing, but maybe not satisfying: a lot was left out, or disconnected, or incomplete. Barry explains a lot along the way about her reflections and struggles of trying to teach art or trying to teaching thinking about art to others, but I had hoped that she would sum up the book with some final tho My brain looks nothing like Lynda Barry's, but I wish it could look like hers more. And I wish I could take a class from her. Reading her syllabi for her three art/philosophy/brain classes was very intriguing, but maybe not satisfying: a lot was left out, or disconnected, or incomplete. Barry explains a lot along the way about her reflections and struggles of trying to teach art or trying to teaching thinking about art to others, but I had hoped that she would sum up the book with some final thoughts, even if those thoughts were not conclusive....but the book kind of just ended. As a creative writing teacher I found this strange book incredibly inspiring. It reinforces the Idea Books I assign and the idea that a notebook should be a place instead of a thing. It is a place for dreaming while I'm awake. I've taken a vow to look at this book every time I feel burnt out as an instructor. I am confident it will rejuvenate me. Freaking awesome!! I've NEVER been what one would call "good at art". (My stick people are crooked) If this book teaches us anything it's that you don't have to know how to draw to do so and you don't have to be "great" at it to be creative! Plus I absolutely LOVE crayons! love this SO MUCH. all educators should read it, particularly humanities/arts/comp. people. Dit boek kreeg ik aangereikt via een van mijn boekblogvriendinnen, ik zocht het op en werd meteen door het uiterlijk getroffen: zo'n Amerikaans schoolschrift, geweldig! 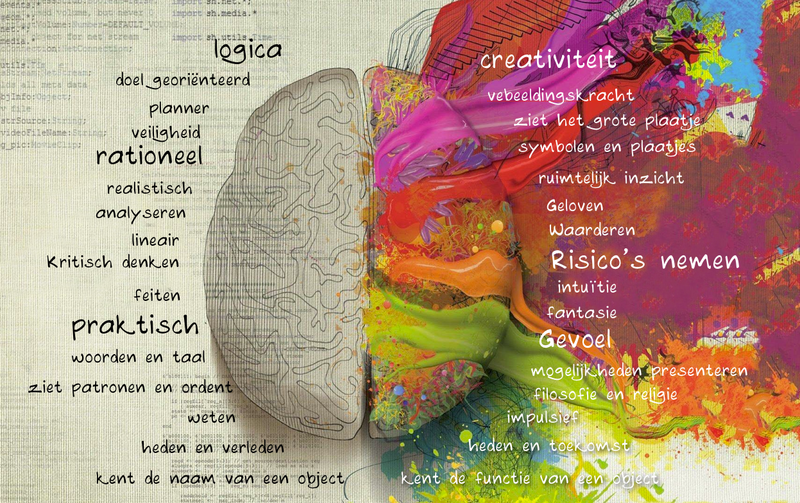 Het is wat de titel zegt: een syllabus, een lesprogramma voor een cursus die The Unthinkable Mind heet. Barry baseert zich qua theorie op de inzichten van Iain McGilchrist en zijn boek The Master and His Emissary: The Divided Brain and the Making of the Western World, dat gaat over de verschillende hersenhelften en hun functies, Dit boek kreeg ik aangereikt via een van mijn boekblogvriendinnen, ik zocht het op en werd meteen door het uiterlijk getroffen: zo'n Amerikaans schoolschrift, geweldig! Het is wat de titel zegt: een syllabus, een lesprogramma voor een cursus die The Unthinkable Mind heet. Barry baseert zich qua theorie op de inzichten van Iain McGilchrist en zijn boek The Master and His Emissary: The Divided Brain and the Making of the Western World, dat gaat over de verschillende hersenhelften en hun functies, die helemaal niet zo duidelijk gescheiden en symmetrisch zijn als dat mooie plaatje van die kleurrijke ontploffing van de rechter helft ons wil doen geloven. De studenten van de cursus moeten kennis nemen van de theorie, zoals ze ook verschillende films moeten zien, interviews moeten luisteren, en gedichten moeten lezen en uit het hoofd leren. Maar vooral moeten ze een heleboel schriften vol maken. Alles om het proces zijn werk te laten doen zonder dat die nadenkende geest roet in het eten gooit. Ze moeten opnieuw leren tekenen, maar wat ze krijgen is geen tekenles. Wat de bedoeling is, is dat ze zonder oordeel laten komen wat komt, dat ze oefenen zonder dat het meteen iets moet 'worden' of 'voorstellen' maar alleen om de hand vaster te maken en de eigenschappen van verschillende materialen te leren kennen. Ze moeten spiralen tekenen terwijl ze luisteren, ze mogen zoveel snoep eten als ze willen als ze maar ieder snoepgoedje eerst natekenen, ze mogen poppetjes tekenen in de stijl van Ivan Brunetti. Er staat een leerzame trailer van zijn boek Cartooning: Philosophy and Practice op Youtube. Dit geeft niet alleen moed en zin om te tekenen, het biedt ook inzciht in de structuur van verhalen. Studenten moeten herinneringen ophalen en beschrijven en/of tekenen, daarvoor heeft Barry een prachtige vragenlijst die ik ook zeker overneem voor autobio-lessen. Hij is ook van toepassing op fictieve scènes, om een personage uit te diepen en om alle zintuigen in te zetten. Syllabus is, al met al, een chaotisch maar mega-inspirerend boek waar ik voorlopig nog niet klaar mee ben. Zelf ben ik meer van het methodisch leren (iedereen wilde ook altijd mijn uittreksels bij kunstgeschiedenis) maar het kan helemaal geen kwaad om het allemaal eens anders aan te pakken. Vooral omdat ik bij heel veel creatieve boeken zo'n gevoel heb van been there, done that. Ik heb een aantal citaten opgeslagen op mijn bord Wijze Woorden op Pinterest, en als je Lynda Barry Syllabus intikt in Google afbeeldingen krijg je een goede indruk van hoe het boek er van binnen uitziet. Nu eens aan mijn boekblogvriendin vragen of ik What it Is ook moet aanschaffen. It's a good book, especially if you focus on the pages from Barry's class syllabuses. Syllabi? Isn't that the oldest joke from college? "Hand out the syllabuses...syllabi...syllabeaux..."
Spellcheck doesn't know the word "syllabi" here. The dictionary does. And Webster's says either syllabuses or syllabi is acceptable. And get this: Plural of octopus? I'm gonna let you guess. No, it's not octopi. It's octopuses. See, octopus is a Greek word. The "i" pluralization is for Latin words. The true Greek It's a good book, especially if you focus on the pages from Barry's class syllabuses. Syllabi? Isn't that the oldest joke from college? "Hand out the syllabuses...syllabi...syllabeaux..."
See, octopus is a Greek word. The "i" pluralization is for Latin words. The true Greek way to pluralize the word would be octopodes. The Scrabble Dictionary does recognize Octopi in addition to Octopuses and Octopodes. Beef? Beeves. This is also the plural form of that kid from Leave it to Beaver. Sphinx? Sphinges. I'm not certain that there's much need to pluralize this word, but I guess if you wanted to talk about more than one Sphinx, there you go. Biceps? Bicepses. Because you already don't sound like an idiot talking about your biceps. Cul-de-Sac? Culs-de-sac. These are my favorites. My favorite is taking a word and adding the S in early. Spiders-Man. Nieces and Nephews? Niblings. This sounds gross. It is gross. I don't like it. Spaghetti? Spaghetto. Also the name for pasta that comes from an economically depressed area. Syllabus is exactly what the title says: the syllabus of a college course Lynda Barry, comic book artist and teacher, taught. She selected students from a variety of disciplines; students came from the arts, literature/writing, but also the sciences, especially of the brain. The course explored image-making: what an image is, how it's "carried" from one person to another, one place to another. The book is in the format of the major tool of the course: a composition notebook. 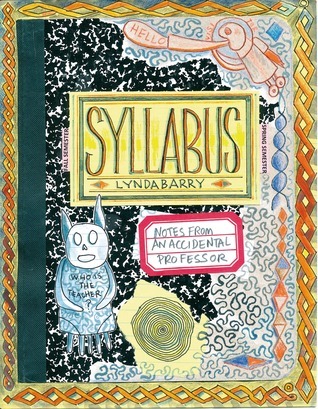 Students used this no Syllabus is exactly what the title says: the syllabus of a college course Lynda Barry, comic book artist and teacher, taught. She selected students from a variety of disciplines; students came from the arts, literature/writing, but also the sciences, especially of the brain. The course explored image-making: what an image is, how it's "carried" from one person to another, one place to another. The book is in the format of the major tool of the course: a composition notebook. Students used this notebook (of which they were to fill several) to keep a daily diary according to the format stipulated by Barry, to notice the kinds of things they "noticed." Also, lots of practice in drawing without thinking. I'm not sure why I found this book so fascinating. It seemed like the kind of course that could lead you to make major artistic breakthroughs--if you could keep up with the coursework! That, on the other hand, looked almost impossible to me (but the students in the class apparently did it). From the book, it seemed like you would have to work several hours daily to keep up. Barry is a hard taskmaster and a strict grader! I'm not sure I'd have the courage to take her class but, if I did, I'm sure I would learn a tremendous amount about being an artist and about myself as an artist. And as a person. The book is only 200 pages of graphic content but there's lots to think about. And, if you wanted, experiment with. Lynda Barry is an American cartoonist and author, perhaps best known for her weekly comic strip Ernie Pook's Comeek.